It is my friend AG who would be the most pleased about this post. I am going to talk about Marseilles, and AG is from Marseilles. Marseilles as most of you know is in the South of France and I am from the East. Now this difference is as big as talking about the difference between the Brits and the Irish, the bretons and the normands, New Englanders and Californians, New Zealanders and Australians. In the end, we all believe that we are the coolest. But back to my story about AG and Marseilles, when we both were in college in Metz (East of France), I cannot tell you how many times I heard “Ah mais à Marseilles, tu sais, c’est tellement plus beau, regarde le gris du ciel ici!” (You know, in Marseilles, everything is so much nicer ; look at this grey sky!) Marseilles here Marseilles there. So much for Marseilles AG, Marseilles was 800 kms away from us and we had to deal with the grey sky in Metz! Tough luck! However, that was not saying everything and AG was somewhat right. In Marseilles, the food is sunny. In Marseilles, when people speak it is like they are singing. In Marseilles, the fish is fresh and above all, it is in Marseilles that bouillabaisse was born. Probably the most known soup in France, non? Have you heard about a dish that boasts more variations than this one? 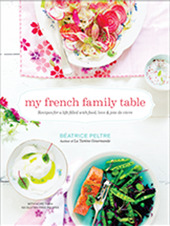 There are as many recipes for bouillabaisse in Marseilles as there are des chefs marseillais. And as good franchouillards (Franchouillards are this species of French people who believe that anything French is better :-)), they all think their recipe is the coolest. I probably do too, I mean I make the best bouillabaisse! Ah! Except that I took a short cut since the *real* (who owns it, I want to know!) recipe is not your average everyday quickly thrown dinner. It requires time and most importantly a various number of fish from Marseilles! ” Quand ça bouille tu baisses “ (when it boils, you reduce)… the heat that is. “Bouillir” means to boil, “Baisser” means to reduce, hence Bouillabaisse. This dish originates from fishermen in the Marseilles and Toulon area (and the beautiful Calanques area) with modest means. Every day after their day fishing, they were simply adding to a pot filled with boiling sea water all the fish pieces they were not going to be able to sell. They ate this fish broth with pieces of toasted bread, “croûtons” , with garlic and rouille or aïoli. This became quickly the fishermen’s meal, la bouillabaisse des pêcheurs. Plats complets (one dish as a main) to feed a bunch of people, these are amongst my favorite dishes to make and eat. Live a leisurely life in a big house in the country with a lap pool, my vegetable garden and orchard, feed all of my friends and family members, and hear the crickets at night in summer, play pétanque and eat clafoutis at 4pm for le goûter, what a perfect dream life! Back to reality. It is winter and it is cold outside. Boil the tomatoes in order to peel them (1 mn). Once done, cut them in quarters and remove the seeds. Chop them thinly. Peel the cerely root and cut in big chunks. Wash the potatoes and cut them in big chunks. Heat up the fish broth until boiling point and reduce. In a separate bowl add warm water to the saffron and let it soak for about 30mns. In your braise pot, heat 1 large tblsp of olive oil. When hot, add the onion and garlic, and cook on low to medium heat until softer (about 4 mns). Add the tomatoes and cook for a few more mns before adding the celery and potato pieces. Cook for a few mns. Add the white wine and fish broth with the chopped herbs, season with salt and pepper and cover before placing in the oven for about 15 mns. After this time, start by adding the bigger pieces of the white and red fish. Cover again and place in the oven for about 15 mns. Take out again and now add the shrimps, (squids, mussels if you have them) and scallops. Place again in the oven for 5 more mns. In a food processor or by hand (which I prefer), place the chopped garlic, the egg yolk and mix well. Add then the tomato paste and harissa. Mix well. Toast a few pieces of nice bread. Take large soup bowls in which you pour 1 or 2 large ladlefuls in each bowl. Spread rouille on the toasted bread and place in the soup (2 small pieces per person, or more if you need). Sprinkle with the parmesan cheese, decorate with fresh flat parsley leaves and serve without waiting! This looks gorgeous, Bea. I ate a lot of bouillabaise when I lived in New York — actually, when I was working for the Crazy Famous People I sometimes write about on my blog — but it never looked as beautiful as this one! quelle photo ! waowww! amazing ! Quelle photo ! waowwwwww ! amazing ! This bouillabaisse looks fantastic. I wish i could have it for supper! That looks delectable. Will definitely add this to my boullabaise recipe collection and try it one day. You make me laugh! Ah, yes the French language will always teach us something. 😉 I am glad I taught this to you, na! Thanks for your sweet note. 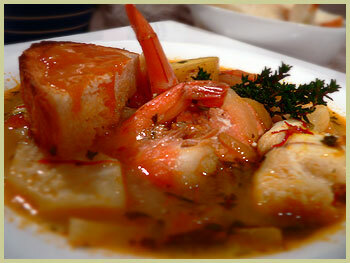 I love to make bouillabaisse, it is one of those dishes that are just very rewarding. Comfort food and so good for you! Merci! It is a nice shortcut from the real LONG one! Thanks a lot. Let me you how it turns out. hi bea, that looks so good – intensely flavoured and deeply aromatic.it’s making me very very hungry! 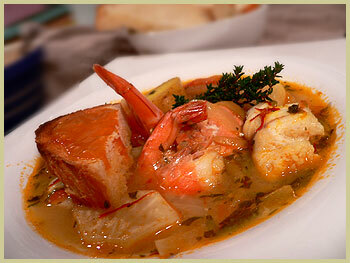 Brrr…on a cold day like today, you’re bouillabaisse looks so inviting!! I like the pics a lot but then I always have a weak spot for your photographs! My comment didn’t seem to go through the first time, so I’m writing again. Your bouillabaisse looks so good on a very cold day like today! And as always, your photo is amazing!! Thanks a lot. I hope you are getting fed thenm but I have no doubt in view of the beautiful dishes I see on your blog! We should do a trade! Thanks for the nice compliment. Your Italian pics make me want to go there pretty much all the time, as I told an Italian friend here on Friday! C’est trop beau and certainly delicious . Is there any part of the bouillabaise that can be made ahead? I’m having a gathering of friends over this Friday and would love to make this. I teach all day and wondered if there really was a simplified way? I have 8 people to serve and wish to use your recipe. How many does this version of yours serve?? Hello Brian, this serves 4 people. Hope this helps, and good luck with it, I hope you all enjoy it! Bonjour Bea, your Bouillabaisse sounds and looks amazing. But it is very different from the recipes I am finding on the net. After all, I think I should trust you since you come from directly from the source. But I do have to ask why you omit the leeks, fennel and orange zest? Does it mean that these ingredients are inventions that do not belong in a Bouillabaisse?? Thanks for your visit. 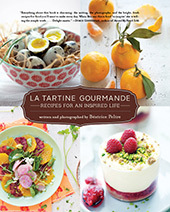 There are tons of bouillabaisse recipes, and mine has been personalized to ingredients I like. A typical bouillabaisse has a lot of fish varieties that I cannot even find on the East coast in the US. For example, celery root would not be common. Orange zest and leeks are common in the recipe. Hope this helps. how do I make the fish stock–can I use regular parsley if I cant find flat ? Hi Char, you could make fish stock with the head and bones of a fish, a bouquet garni and one onion (or even a shrimp one using the shells from shrimps, rather than discard them). If you run short of time, simply use clam juice, it works well too. And yes, regular parsley is fine. I like the simplifications you’ve made, and with the photo it really looks good! By the by, are you the @chefbea who pops into the Rex Parker NY Times crossword puzzle blog? That would be quite the coincidence as I read that every day! Recipe and photo looks great and I will fix this dish very very soon (maybe tomorrow)! But I have questions. (1) One of your recipe steps is to “Heat up the fish broth until boiling point and reduce.” Do you mean that one should reduce the heat level to below boiling OR to continue boiling and reduce the amount of stock (and if so by how much)? And (2) could you give some ideas of how much coriander, parsley, tarragon, salt & pepper to add (or at least start with)? Thanks so much. Thx for relish recipe! How long does Bouillabaisse keep? Hi Louise, thank you. I would say just one to two days because of the fish. with all those ingredients ???? This looks the same as we may order in the restaurant.